I go weak in the knees for smoked salmon risotto. If it’s on the menu at a restaurant, it is what I’m going to order. Still, I always did feel a little naive paying $20 for a rice dish. After I ordered some Aoraki Hot Smoked Salmon from Naturally Organic, I figured it was finally time to attempt risotto. I used the stainless steel sauté pan that Mum gave me and it was perfect for the job. You need something with decent sides but also plenty room for the rice to absorb liquid in. While it might be possible to use a skillet, you would have to be extra careful while stirring. In hindsight, I could have added a little more stock at the end. While the rice was cooked, it absorbed even more liquid on standing. Some sources say to stop just before the rice is cooked. 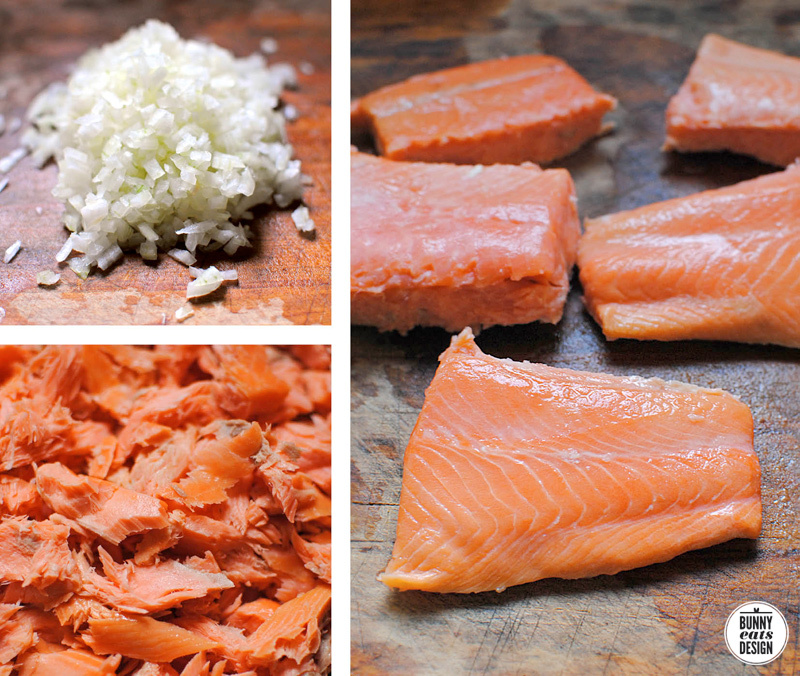 Once upon a time, you could only get cold smoked salmon but now you can find both in equal abundance. I prefer hot smoked salmon but I will gladly eat both. Both can be eaten “as is” or gently heated. Just in case you were wondering what’s the difference between cold smoked salmon and hot smoked salmon, in terms of flavour and texture, cold smoked is salty and the texture is silky smooth and because it is a raw, it looks and and has a similar mouth-feel to sashimi. It is usually sold in pieces, off the bone and must be cut with scissors or a knife. Hot smoked salmon often has sweet notes, though is still savoury and because it is cooked, it can be flaked easily. It has the same mouth-feel* to baked or pan-seared salmon. Hot smoked salmon is sold whole, as whole fillets or in pieces and portions. It is easy to break up between your fingers or with a fork. *mouth-feel refers to the textural feeling of something your mouth. In a small saucepan, heat the stock to boiling, then turn down to simmer for the duration of the cooking time. Using hot stock keeps the risotto temperature from fluctuating too much. Put a sauté pan or other walled frying pan to medium heat and add oil and onions. Cook for 5 minutes stirring occasionally. Add rice and garlic and cook for a further 2 minutes. Add 1 cup of the heated stock to the rice and turn the heat to the lowest setting. You don’t want to boil the rice, you want it to swell from absorbing the stock. No boiling, not even a simmer, barely even a bubble is fine. Stir rice occasionally, pushing rice from the sides for approximately 5 minutes until the stock has been absorbed. Keep adding the stock 1 cup at a time every 5 minutes or so until the rice is cooked, with a tiny bit of bite in the centre. The rice should taste cooked. Towards the end, add less stock at a time and let it absorb before adding more. While the risotto is cooking, gently flake apart the salmon, reserving a few nice looking pieces to top the risotto with later. 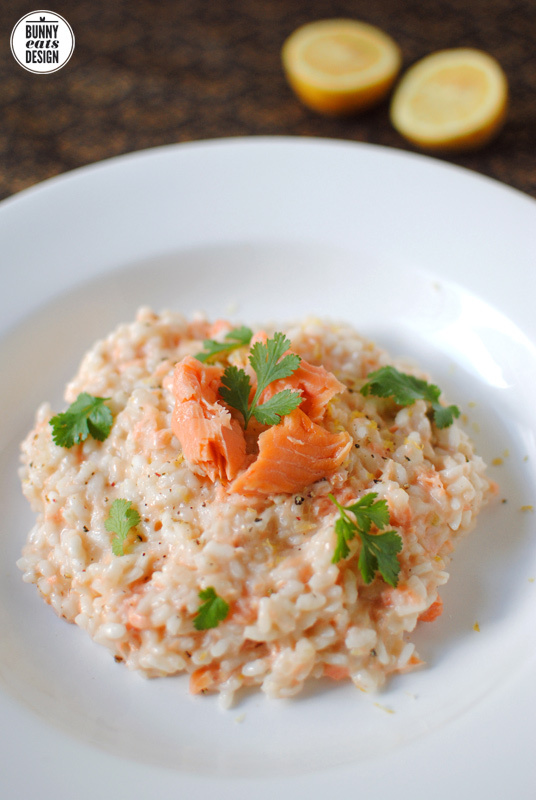 Once the risotto is cooked, take off heat, add the flaked salmon, Parmigiano-Reggiano, cream and lemon zest. Leave for 5 minutes to settle, then taste and adjust seasoning if required. I found the salmon sufficiently salty. Serve with fresh coriander and a juicy wedge of lemon to squeeze. Now that I can make this at home, I don’t know if I’ll still order it when I eat out. I have a tendency of ordering dishes I enjoy but do not cook at home. 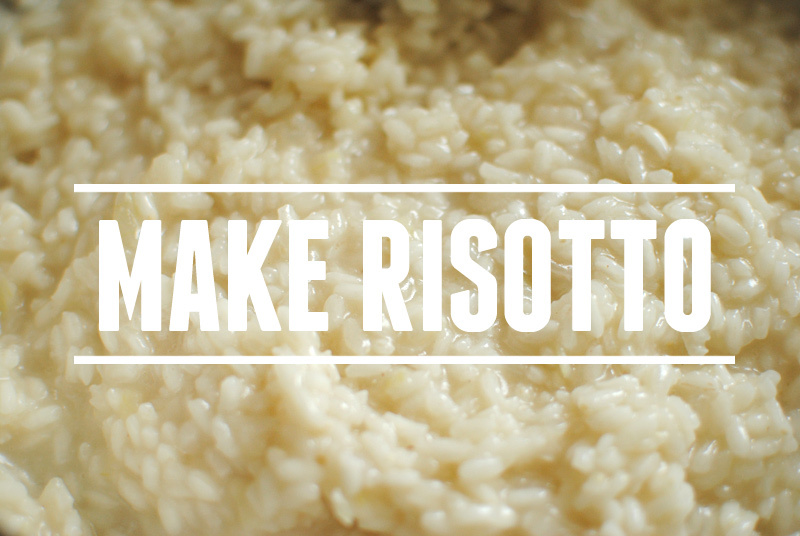 Do you like risotto and do you order it when you eat out? This post is part of Our Growing Edge, a monthly blogging event to encourage us to try new food related things. Stacey from The Veggie Mama is the host for month’s event. If you have a blog and have cooked, eaten or experienced a new food this month, come and join this event. Hi Gray, yep, you’re right, I would make it wetter next time too. It was about right when I stopped cooking but after standing and mixing in the cheese and salmon, it absorbed even more liquid. That does look yummy! I’ve made risotto a handful of times, and it’s always come out tasty. Too bad the hubby doesn’t like the texture, hence why I haven’t made it that much. Isn’t it funny how people are with texture? I love the texture of all rice dishes, but The Koala isn’t so keen. I wonder if it has to do with genetics or upbringing? My husband’s weird. He loves pasta, he loves rice, but he hates orzo. WTF? Lovely risotto! The salmon looks stunning :3 Cheers! Thanks Alice, salmon has a way of looking gorgeous. oh my god that looks so good!!!!! You haven’t? Is smoked salmon popular in Singapore? only cold-smoked salmon, and only on eggs benedict! come to think of it, I’ve never actually seen smoked salmon risotto on a menu anywhere, only smoked haddock perhaps! Yum! I love risotto, and I’ll order it at restaurants because I know I probably can’t make a decent one at home. I’ve always been a bit intimidated to perfect it. But you make it sound a bit more achievable. Definitely something I want to tick off my “To do” list. I have to admit, I’m not sure where risotto got such a scary reputation. Maybe it’s because the simplest things are the hardest to perfect. But you can do an ok job and then perfect it from there. I’ve only cooked it once, but I can see already what I’d tweak for next time and that could be addictive. Maybe that’s where the bad rep comes from. Seconded – I was so very intimidated the first time I made risotto, but it’s really not hard at all! I love risotto but I’ve never made it. I don’t know why I’m so intimidated by it! And I’ll take smoked salmon hot or cold – I love it in all incarnations. This looks delicious, lady! Thanks, I think it was all the stirring that frightened me. But it’s really not that intensive. If anything goes wrong, it’s fairly easy to correct. Too soupy, keep cooking, too dry, add more stock. Hey, if you both like to order risotto, it’s very worth making at home. The Koala would never order risotto so this was an indulgence aimed just for me. What a delicious dish. 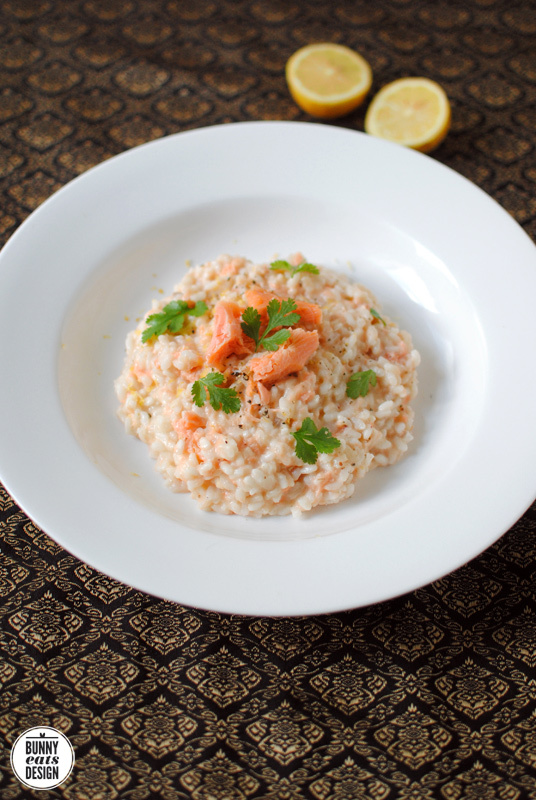 It’s hard to beat anything with smoked salmon (of either kind) but I especially love risotto and your photos make it look doubly mouth-watering!. Hi Jessie. It’s funny the dishes that make you feel like you have achieved something. This was one for me. Looks delicious. I prefer hot smoked salmon too. This has to be the most magnificent risotto I have ever seen – delicious. That risotto is just beyond good! I tried it and it turned out really well! Thanks for sharing it! That looks fantastic! Bravo, Genie! I do risotto like how you did it: leaving the grains a little al dente. That being said, my co-teacher last semester was from Rome (and the chair of the Food Studies department to boot, so I guess he knows) and he says a proper risotto should actually be crunchy on this inside. That doesn’t sound good to eat, does it? Have you heard of that?